"I just started uploading videos to my You Tube Channel. Then I copied the embed code and loaded the video to my Wordpress Blog. All works great except a ton of other videos are listed as thumbnails beneath mine and can be played on my blog. I do not want these videos on my site. How do I get them off and why are they attaching when I copy my embed code?" Part of YouTube hosting your videos for free is recommending videos from other YouTube users in the files embedded on other sites. YouTube does have a feature for turning off these extra video clips, but they hide it because they really want people to watch as many YouTube videos as possible. Every YouTube video has a little cog icon next to the box where you copy the embed code. 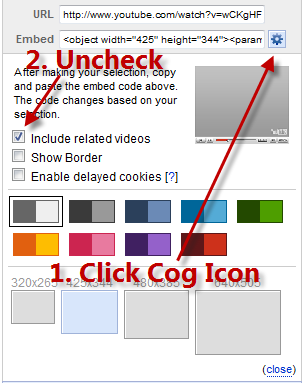 If you click this cog, you can change a number of things about your embed, like the color of the player, the size of the player, and the border around the video. In your case, the most important change here is whether you are including the thumbnails of related videos when you embed your own videos on your blog. Uncheck the box next to Include Related Videos and YouTube will automatically update the embed code so you won't see those thumbnails on your video.